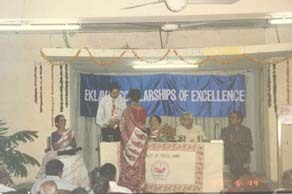 The Eklavya Scholarships of Excellence have been instituted by Eklavya to recognise and reward the spirit of excellence among students of recognised graduate and post-graduate courses in various disciplines. The awards consists of a medal, certificate and a cash prize. The students obtaining these scholarships will be know as Eklavya Scholars. 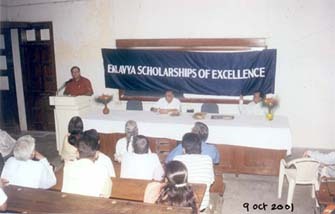 Eklavya Scholarship of Excellence function held at Faculty Social Work, MSU Baroda. Dept. of Mathematics, Guj. Uni.